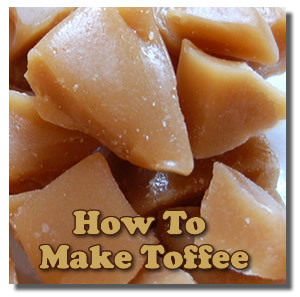 Learning how to make toffee is easier than you may think! Toffee is technically classified as a dessert, a delicious sweet course best eaten at the end of a meal. However, toffee is also often made as a candy, which gives me an excuse to eat it any time I want! Toffee as a basic recipe is formed by boiling sugar syrup to a high temperature. This usually results to a hard yet slightly chewy toffee candy which becomes even more flavorful with cream and butter. The degree of hardness is determined by how high a temperature reaches during cooking. Toffees are also commonly served with roasted or chopped nuts and chocolate. Other recipes include fruit, like the famous toffee apples that so many of us have enjoyed for years. You have to admit that toffee apples are time tested winners which most people love to eat, regardless of their age. 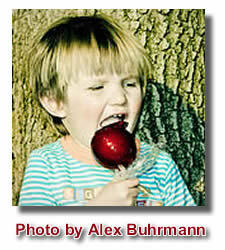 Parties and special occasions are usually associated with a toffee apple splurge,. You may even remember, like I do, those wonderful carefree days of youth when a toffee apple treat from the county fair was something you eagerly anticipated. There are toffee recipes for basic plain toffee, but a whole variety of toffee can be made by using different kinds of fruits and nuts as well. A lot of toffee recipe are available in print ads, magazines, and of course on the net. Various toffee recipes offer different techniques in preparing toffee but most will deliver a delicious end result. You can even create your own specialty kind of toffee based on your palate and tastes. Here are some of my favorite toffee recipes, including English toffee, pecan toffee, almond toffee and even heath bar toffee. Butter or line a baking tray in preparation for the hot toffee. Combine sugar, water, and vinegar in a heavy saucepan and heat on medium heat, stirring constantly until the sugar is dissolved. Bring mixture to the boil and cover, cooking for 3 minutes. Remove lid and continue to boil until your candy reaches the soft crack stage (270 - 290 F.). Pour hot candy onto prepared tray and allow to cool. Be careful not to burn yourself. If you like, you can make marks on the candy with a knife before it fully sets so that it will be easier to break in even pieces once it hardens. Put water and sugar into a saucepan. Turn the stove onto moderate heat. When the sugar has dissolved, add the vinegar, syrup and butter. Be sure not to spill the sugar mixture on your skin, as it can cause a severe burn. Be gentle in adding and stirring. Do not leave the mixture while cooking to avoid overcooking it. After turning off the stove, stir in the food coloring if you are using it. Then, use a wooden stick to pierce each of the apples. Dip the apple into the hot toffee. Make sure that each apple is fully coated by turning it around in the syrup. Allow the apples coated with the toffee to harden by placing them on an oiled tray. Allow enough space for each toffee apple to set without touching or sticking together. You can wrap the coated toffee apples with cellophane if you want to present them as gifts or save them for a few days. Now that you know how to make toffee, go for it. There's a saying that, "the way to a man's heart is through his stomach." When it comes to these yummy toffee recipes, I think you'll win everyone's heart. Have a Question About Toffee or a Favorite Recipe to Share? Do you have a favorite toffee recipe that you picked up somewhere along the way? Share it with the rest of us. If you've got a photo, please do show off a bit! We'd love to see your work. If you have a question about making your own toffee candy, ask away. Hopefully your fellow toffee lovers can share some of their candy making techniques. If you're an old hand at making toffee, take a few minutes and help out someone else who's struggling by joining the conversation. Why does the chocolate fall off of my homemade toffee? How can I keep my toffee from getting sugary? Making toffee and peanut brittle in Florida?